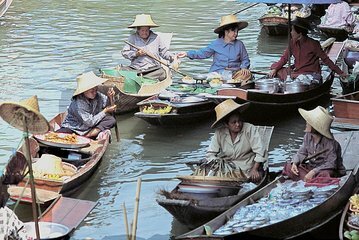 Explorez les couleurs du marché flottant de Damnoen Saduak lors d'une excursion d'une demi-journée au départ de Bangkok, et découvrez la vie sur les canaux animés de la Thaïlande. Rencontrez des producteurs locaux dans des bateaux étroits avec des piles de produits frais et d'objets artisanaux, goûtez les spécialités locales du fleuve et capturez les scènes photogéniques. Rendez-vous au marché à travers la végétation luxuriante de la campagne thaïlandaise qui entoure Bangkok ; traversez les plantations de palmiers, les villages et les champs agricoles et obtenez un aperçu de la vie à l'extérieur de la ville. An experience well worth seeing , but the canal boat trip was just on and off and too crowded to enjoy. The local markets are good , and the journey enjoyable and an opportunity to see outside Bangkok. If you are looking for a local for Thai people floating market, this is NOT it!! the canals. Don't even think of going through the canal with a paddle driven boat unless you have plenty of time on your hands. We signed up for a paddle driven boat, but asked for a refund after waiting at least 30 minutes for a boat. There was just too much congestion in the canal and everything moved slowly. Just walk along the canal and call out to a boat if you like what it offers. They have baskets on long poles to make exchanges. So yes, worth seeing once, but just understand this is a tourist trap. Thoroughly enjoyed thiis, our guide was superb . Turned out to be our guide ,driver and just the two of us so very comfortable. The market is completely tourist driven as opposed to being a genuine 'local' market but that did not disappoint. Great atmosphere in this floating traffic jam . Tic tac twixt boat driver and vendors is amazing . If you look interested in anything they will take the boat back to the stall. Be prepared for some quick bartering and you have to be firm , but polite, if it is something you do not want. Our guide was very helpful re appropriate tips and where to start the bartering process. We did feel peckish for a couple of bananas and ended up with a massive bunch. Still they were very nice. Lovely half day tour to the floating markets, we were the only people on the tour which took in a coconut farm where we could see how they make the coconut milk followed by some time at thr markets. The markets themselves are interesting but they do tend to sell a lot of tourist tat. Still it's worth a look. The market itself is full of tourist tat but go for the experience especially if you enjoy photography. Stopped at the railway market on route. Very interesting if you enjoy a good food market. Also stopped at a plantation which was interesting but a little too long. Excellent tour. Loved the Floating Market. We had a wonderful time sailing down the river to the market. Plenty of time to look around and didn't feel rushed. Mindy, our guide, was very good at explaining things and extremely sweet. The side trip to learn more about coconuts was also excellent. Recommended.